We’re back to school. Back to tight schedules and soccer practices; back to squeezing in a healthy dinner in the few remaining daylight hours. Every year about this time, I start sifting through Pinterest for quick family meals. But, I’ve got a secret to make back to school a little easier. 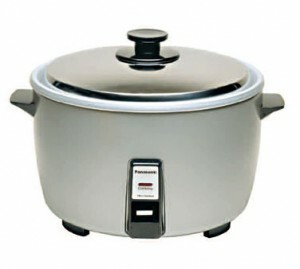 Let’s talk about one of my favorite kitchen small appliances for your home or your restaurant, rice cookers. A rice cooker is made to simplify cooking…well, rice. Using a rice cooker to prepare rice for your family is as simple as adding rice along with the appropriate amount of water and pressing a button to turn on the cooker. Whether you choose white rice, basmati rice, jasmine rice, or healthy brown rice; once you prepare rice in a rice cooker you’ll never go back to the old-fashioned, stovetop method. It gets better. If you’re not ready to serve, the rice cooker will hold your perfectly cooked rice at the appropriate temperature until you ARE ready. No more waiting for the rice to boil and watching the pan every minute to make sure the water doesn’t boil over. No more rushing around the kitchen to perfectly time every piece of your meal. Ahh, sweet relief. Okay, on to my secret. Another benefit of using a rice cooker is that it can be used for more than just cooking rice. Scouts honor. Your rice cooker has hidden talents. With a little experimentation, you can cook breakfast, poach fruit, or even make risotto with less hassle than cooking it on a stovetop. 1. Make a hot breakfast. To make oatmeal or other hot cereals, add a little less milk or water than you would for stovetop cooking (and some chopped nuts and dried fruit if you want). The “keep warm” function will keep food from getting cold and gooey―perfect for days when everyone gets up at a different time. 3. Make risotto without stirring. Sauté onions in butter in an open rice cooker, then add 1 part Arborio rice and 4 parts liquid (such as broth and wine). Cook for about 25 minutes in an on/off cooker or use the “slow” or “porridge” cycle if your machine has one. Mix in grated cheese and herbs at the end. 4. Slow-cook soups, beans, or stews. Give your rice cooker enough liquid and time and it will create long-simmered dishes without scorching or boiling over (the way slow cookers sometimes can). Try split-pea soup with ham, or put beef (that’s been browned on the stove) and vegetables in the cooker with tomatoes, wine, and herbs for a hearty dinner. A rice cooker works for healthy desserts of fruit simmered in juice, wine, or maple syrup. Or make applesauce and other fruit sauces. True produces environmentally friendly refrigeration systems by matching and balancing oversized compressors, evaporators, and condenser coils. These refrigeration systems include shorter run times, lower energy consumption, and the industry’s coldest holding temperatures. True’s evaporator coils have 20%-40% more surface area than the industry standard resulting in faster pull down of product temperatures and quicker recovery times. By utilizing large condensers with more standard passes, True units will ensure better food preservation in the hottest, most extreme foodservice environments. True’s low velocity motor fans are completely sealed, oil-filled, and self-lubricating. They have a life expectancy of 15 to 20 years! The motors are matched with larger fan blades giving True cabinets high volume low velocity airflow that produces a large volume of air passing across the evaporator at a slow rate. 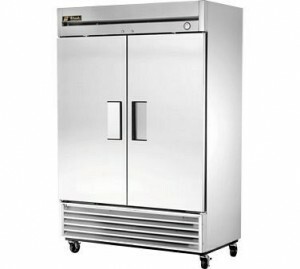 This allows for faster recovery and better uniform temperature throughout the refrigeration unit. True continues its commitment to sustainability by pioneering the use of Ecomate, a foamed in place, CFC free polyurethane, high-density insulation. Ecomate provides unparalleled strength, rigidity, and an increase to an already industry-exceeding insulation factor, with zero ozone depletion potential (ODP) and zero global warming potential (GWP). Along with their 3 year parts & labor warranty, True’s exclusive unit warranty is the envy of the industry. At no additional cost, customers enjoy the option of having the entire condensing unit replaced. This consists of a new compressor, condenser, start components, and fan motor; all of which are pre-assembled and shipped from the factory. True internally manufactures their own heavy-duty shelves, utilizing larger diameter steel for strength. The shelves are bonded with powdered PVC to prevent chipping and peeling. True employs their own internal customer service, parts customer service, and technical support to be there to help at any time throughout the life of your unit. True’s dedicated staff is a great source for educated sales, design and after sale support. True is committed to eco-friendly manufacturing by meeting and surpassing the energy standards while not sacrificing performance. By using oversized, higher capacity, balanced refrigeration systems, true outperforms industry efficiency expectations. In order to verify that all units re manufactured properly and to specification, True run tests every single model as a part of the final quality inspection before releasing the unit into finished goods inventory. By maintaining an extensive level of inventory in their Missouri based manufacturing facility, True can fill nearly 100% of standard items within 2-3 days of receiving and processing your purchase order. Cutlery is an important commercial and home kitchen staple that can directly impact the preparation and presentation of food. Ever start chopping away inside your kitchen and wonder if you’re using the right knife? You’ll typically see key points such as size, shape, blade and type of edge when specifying the appropriate knife for cooking and food prep. Here, we’ve taken it a step further by offering general descriptions to serve as a basic guide for the most common knife types. Boning knives have a sharp point and narrow blade. Typically available with blades ranging from 3″ to 8″ in length, boning knives are used in food preparation for separating and removing the bones from poultry, meat, and fish. Boning knives are not as thick as some of other popular kitchen knives, as this makes precision boning, especially in deep cuts and holes, much less difficult. A stiff boning knife is good for boning beef and pork, but a very flexible boning knife is preferred for poultry and fish. Bread knives are designed with serrated edges to cut soft bread and fruits like tomatoes without crushing them. Bread knives can have straight or slightly curved blades and range from 6-10 inches in length. Butcher knives are designed especially for breaking through larger, tougher cuts of meat. A slip resistant, nylon or fibrox handle is ideal for slicing and dicing an assortment of meats, ensuring that the user maintains a firm grasp. 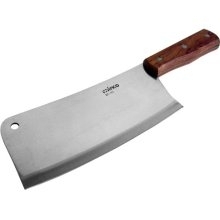 Butcher knives have heavy, wide and slightly curved blades. With a thinner handle and wider blade than traditional slicing knives, these sturdy cutting tools are perfect for separating larger pieces of meat, such as poultry, roasts, and hams into thin, precise slices. Chef’s knives are ideal for everything from slicing meat to chopping and dicing fruits and veggies. Available in sizes ranging from 6 to 12 inches, chef’s knives are designed to perform a variety of tasks in busy kitchen. These versatile knives feature sharp, high carbon steel blades for more precise cutting, slicing and mincing. Cleaver knives are ideal for slicing meats as well as chopping or mincing vegetables, and can even be used to crush bulbs of garlic or ginger. Cleavers feature large, stainless steel blades with wooden handles. Designed specifically for Brazilian steakhouses, churrasco knives are the perfect cutting tools for slicing large chunks of meat directly from spits onto the plates of hungry customers. Constructed almost as a mix between slicing and carving knives, these unique cutting tools are great for slicing through cooked meat at all different angles. Paring knives are used for small, intricate work like peeling and coring. A good paring knife typically measures between three and five inches on the blade. Paring knives are designed to be an all-purpose knife, similar to a chef’s knife, but on a smaller scale. New Products from the Brands you Love! Log on to www.Burkett.com today and shop our newest arrivals! As much as I loathe saying it, summer is winding down. The weather in the Midwest is already chilling. Soon we’ll see the shutters on our little lakeside snack shops coming down in preparation for the coming fall and winter months. As summer fades into fall, it’s the perfect time to take a look at your refrigerated beverage dispenser. Whether you’re packing up and closing shop for the season, weaning your patrons from frosty mixed drinks, or breaking out the concession equipment for the upcoming school year, the demand on your beverage dispensers has decreased…for a moment. Now is the time to take a look at your current dispenser’s state and look for the indications listed below that it’s time to go shopping. Water Leaks: If water leaks through the bin seal or manufactured chassis, this may indicate a leak in the line or rupture in the corner seal. This could be an indication that the unit has reached the end of its service life. 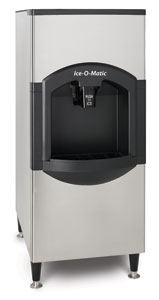 Aging Unit: Many beverage dispenser components, such as valves, can be replaced. It also is possible to upgrade and refurbish these units. But if the equipment had been in operation for 10 years or more in a high-volume application, it’s more than likely time to replace the unit as a whole. Appearance: Put yourself in the customer’s shoes. If they notice an older, self-serve unit at the front of the house, how will that affect your sales? In this case, it’s important to keep up appearances. Changing Menu: A common issue when purchasing beverage dispensers is buying too small or too large a dispenser for the necessary volume. When the beverage menu changes or expands, foodservice operators should re-evaluate whether the dispenser can meet the restaurant’s needs. If the operation requires more capacity consider whether a larger unit or additional dispenser would be most appropriate. Once you’ve checked these items off your list, keep your beverage dispenser in tip-top shape by regularly following cleaning procedures. This will help ensure the quality and taste of beverages isn’t compromised. 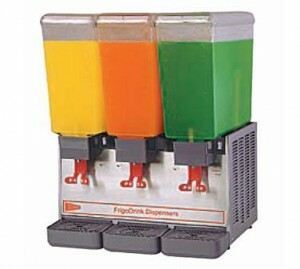 Beverage dispensers can be merchandising tools especially when used in the front of house for self-service applications. For this reason, it’s important that these units are properly cleaned and maintained. Foodservice operators can perform daily, weekly, and monthly tasks that will help keep your beverage dispensers operating at an optimal level, while ensuring a long service life. Keep in mind that unit needs may vary, and manufacturer’s recommendations should be followed. On a daily basis, staff should remove the nozzles and diffusers and soak them in warm, soapy water. At the end of the day wipe down exterior surfaces with soap and water to remove any build-up and/or spills. Refrain from using cleaners with high chlorine content on stainless steel, as they may cause rust. Regularly flush and clean water lines. And finally, each month, clean and wash ice bins.